Little is known of Mr Babbage's parentage and early youth except that he was born on 26 December 1792. However, a nephew wrote to The Times a week after the obituary  appeared, saying that Babbage was born on 26 December 1791. There was little evidence to prove which was right until Hyman (see ) in 1975 found that Babbage's birth had been registered in St Mary's Newington, London on 6 January 1792. Babbage's father was Benjamin Babbage, a banker, and his mother was Betsy Plumleigh Babbage. Given the place that his birth was registered Hyman says in  that it is almost certain that Babbage was born in the family home of 44 Crosby Row, Walworth Road, London. Having suffered in health at the age of five years, and again at that of ten by violent fevers, from which I was with difficulty saved, I was sent into Devonshire and placed under the care of a clergyman (who kept a school at Alphington, near Exeter), with instructions to attend to my health; but, not to press too much knowledge upon me: a mission which he faithfully accomplished. Amongst these were Humphry Ditton's 'Fluxions', of which I could make nothing; Madame Agnesi's 'Analytical Instructions' from which I acquired some knowledge; Woodhouse's 'Principles of Analytic Calculation', from which I learned the notation of Leibniz; and Lagrange's 'Théorie des Fonctions'. I possessed also the 'Fluxions' of Maclaurin and of Simson. Thus it happened that when I went to Cambridge I could work out such questions as the very moderate amount of mathematics which I then possessed admitted, with equal facility, in the dots of Newton, the d's of Leibniz, or the dashes of Lagrange. I thus acquired a distaste for the routine of the studies of the place, and devoured the papers of Euler and other mathematicians scattered through innumerable volumes of the academies of St Petersburg, Berlin, and Paris, which the libraries I had recourse to contained. Under these circumstances it was not surprising that I should perceive and be penetrated with the superior power of the notation of Leibniz. It is a little difficult to understand how Woodhouse's Principles of Analytic Calculation was such an excellent book from which to learn the methods of Leibniz, yet Woodhouse was teaching Newton's calculus at Cambridge without any reference to Leibniz's methods. Woodhouse was one of Babbage's teachers at Cambridge yet he seems to have taken no part in the Society that Babbage was to set up to try to bring the modern continental mathematics to Cambridge. I then drew up the sketch of a society to be instituted for translating the small work of Lacroix on the Differential and Integral Calculus. It proposed that we should have periodical meetings for the propagation of d's; and consigned to perdition all who supported the heresy of dots. It maintained that the work of Lacroix was so perfect that any comment was unnecessary. Babbage talked with his friend Edward Bromhead (who would become George Green's friend some years later- see the article on Green) who encouraged him to set up his Society. The Analytical Society was set up in 1812 and its members were all Cambridge undergraduates. Nine mathematicians attended the first meeting but the two most prominent members, in addition to Babbage, were John Herschel and George Peacock. It is a lamentable consideration, that that discovery which has most of any done honour to the genius of man, should nevertheless bring with it a train of reflections so little to the credit of his heart. Two further publications of the Analytical Society were the joint work of Babbage, Herschel and Peacock. These are the English translation of Lacroix's Sur le calcul différentiel et intégral published in 1816 and a book of examples on the calculus which they published in 1820. He did not compete for honours, believing Herschel sure of first place and not caring to come out second. Indeed Herschel was first Wrangler, Peacock coming second. Babbage married in 1814, then left Cambridge in 1815 to live in London. He wrote two major papers on functional equations in 1815 and 1816. Also in 1816, at the early age of 24, he was elected a fellow of the Royal Society of London. He wrote papers on several different mathematical topics over the next few years but none are particularly important and some, such as his work on infinite series, are clearly incorrect. However in 1820 he was elected a fellow of the Royal Society of Edinburgh, and in the same year he was a major influence in founding the Royal Astronomical Society. He served as secretary to the Royal Astronomical Society for the first four years of its existence and later he served as vice-president of the Society. Babbage, together with Herschel, conducted some experiments on magnetism in 1825, developing methods introduced by Arago. In 1827 Babbage became Lucasian Professor of Mathematics at Cambridge, a position he held for 12 years although he never taught. The reason why he held this prestigious post yet failed to carry out the duties one would have expected of the holder, was that by this time he had become engrossed in what was to became the main passion of his life, namely the development of mechanical computers. ... I was sitting in the rooms of the Analytical Society, at Cambridge, my head leaning forward on the table in a kind of dreamy mood, with a table of logarithms lying open before me. Another member, coming into the room, and seeing me half asleep, called out, Well, Babbage, what are you dreaming about?" to which I replied "I am thinking that all these tables" (pointing to the logarithms) "might be calculated by machinery." Certainly Babbage did not follow up this idea at that time but in 1819, when his interests were turning towards astronomical instruments, his ideas became more precise and he formulated a plan to construct tables using the method of differences by mechanical means. Such a machine would be able to carry out complex operations using only the mechanism for addition. Babbage began to construct a small difference engine in 1819 and had completed it by 1822. He announced his invention in a paper Note on the application of machinery to the computation of astronomical and mathematical tables read to the Royal Astronomical Society on 14 June 1822. Although Babbage envisaged a machine capable of printing out the results it obtained, this was not done by the time the paper was written. An assistant had to write down the results obtained. Babbage illustrated what his small engine was capable of doing by calculating successive terms of the sequence n2 + n + 41. The terms of this sequence are 41, 43, 47, 53, 61, ... while the differences of the terms are 2, 4, 6, 8, .. and the second differences are 2, 2, 2, ..... The difference engine is given the initial data 2, 0, 41; it constructs the next row 2, (0 + 2), [41 + (0 + 2)], that is 2, 2, 43; then the row 2, (2 + 2), [43 + (2 + 2)], that is 2, 4, 47; then 2, 6, 53; then 2, 8, 61; ... Babbage reports that his small difference engine was capable of producing the members of the sequence n2 + n + 41 at the rate of about 60 every 5 minutes. Babbage was clearly strongly influenced by de Prony's major undertaking for the French Government of producing logarithmic and trigonometric tables with teams of people to carry out the calculations. He argued that a large difference engine could do the work undertaken by teams of people saving cost and being totally accurate. Mr Babbage has displayed great talent and ingenuity in the construction of his machine for computation, which the committee thanks fully adequate to the attainment of the objects proposed by the inventory; and they consider Mr Babbage as highly deserving of public encouragement, in the prosecution of his arduous undertaking. ... six orders of differences, each of twenty places of figures, whilst the first three columns would each have had half a dozen additional figures. Such an engine would easily have been able to compute all the tables that de Prony had been calculating, and it was intended to have a printer to print out the results automatically. However the construction proceeded slower than had been expected. By 1827 the expenses were getting out of hand. The year 1827 was a year of tragedy for Babbage; his father, his wife and two of his children all died that year. He own health gave way and he was advised to travel on the Continent. After his travels he returned near the end of 1828. Further attempts to obtain government support eventually resulted in the Duke of Wellington, the Chancellor of the Exchequer and other members of the government visiting Babbage and inspecting the work for themselves. By February 1830 the government had paid, or promised to pay, £9000 towards the project. In 1830 Babbage published Reflections on the Decline of Science in England, a controversial work that resulted in the formation, one year later, of the British Association for the Advancement of Science. 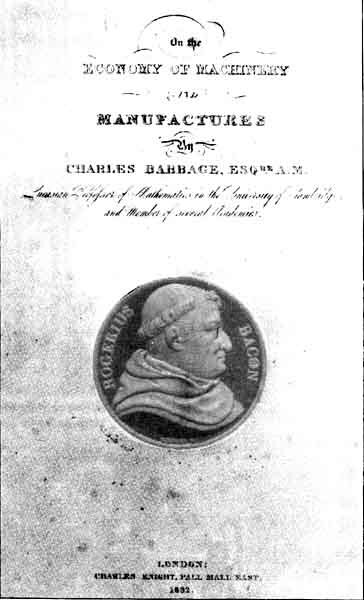 In 1834 Babbage published his most influential work On the Economy of Machinery and Manufactures, in which he proposed an early form of what today we call operational research. Babbage had every reason to feel aggrieved about his treatment by successive governments. They had failed to understand the immense possibilities of his work, ignored the advice of the most reputable scientists and engineers, procrastinated for eight years before reaching a decision about the difference engine, misunderstood his motives and the sacrifices he had made, and ... failed to protect him from public slander and ridicule. ... all the variables to be operated upon, as well as all those quantities which had arisen from the results of other operations. ... into which the quantities about to be operated upon are always bought. Every set of cards made for any formula will at any future time recalculate the formula with whatever constants may be required. Thus the Analytical Engine will possess a library of its own. Every set of cards once made will at any time reproduce the calculations for which it was first arranged. The store was to hold 1000 numbers each of 50 digits, but Babbage designed the analytic engine to effectively have infinite storage. This was done by outputting data to punched cards which could be read in again at a later stage when needed. Babbage decided, however, not to seek government support after his experiences with the difference engine. ... elaborations on the points made by Menabrea, together with some complicated programs of her own, the most complex of these being one to calculate the sequence of Bernoulli numbers. This was an underestimate. The construction of modern computers, logically similar to Babbage's design, have changed the whole of mathematics and it is even not an exaggeration to say that they have changed the whole world.